Welcome again to the monthly newsletter from Chiropractic Help. Firstly, a big thank you to all of you who responded to my question last month. The longer monthly version of your newsletter is obviously the favourite. Apologies for not having responded to each and every one of you, but I want you all to know how much I appreciate the time you took to write. This one too is rather long, so make a big pot of tea, get comfortable and view this on your computer not the laptop. Why not? Make sure you have set "view the graphics" if you're on a PC and, on an AppleMac, I fear you may have to look at the online back issues. The graphics may not appear. 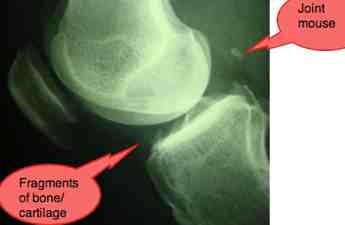 So, what are the symptoms of arthritis in knee ? 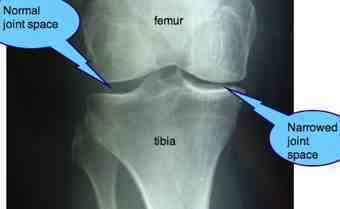 Flexion of the knee was almost normal, but there was loss of 25 degrees of extension. Any attempt to straighten the knee caused extreme pain. The Bounce Home test was very positive. X-rays show severe loss of the hyaline cartilage that lines the medial femoral and tibial condyles, with many fragmented pieces of cartilage (joint mice) floating in the synovial fluid. The tibial spines are severely sharpened. There is of course no certainly of the future. Research at the medical university at Utrecht, NL, has shown that cartilage can regrow if the knee is unloaded. Mrs X has done most of that hard work. Another 10-15 pounds and she has a good chance of escaping a total knee replacement, at least in the immediate future. I have the utmost admiration for Mrs X. It's not been an easy, happy ride I can assure you. Both she and we have had doubts. Were we wasting precious time and money? Should she just go and have the operation? But no, she stuck with the programme, even when there were setbacks. Her determination to get well was overwhelmingly evident. I have no difficulty with taking anti inflammatory drugs (NSAIDs) for a short trial to see if they might help, but taking them long term as Mrs X had done, is highly dangerous. With NSAIDs there is much to be lost. Even in the treatment of neck pain, where there is some very small risk from chiropractic manipulation, a literature search by Dabbs and Lauretti concluded "The best evidence indicates that cervical manipulation for neck pain is much safer than the use of NSAIDs, by as much as a factor of several hundred times." In the next week I'll be writing up a similar case of a woman who was also much worse after arthroscopy. She was unable to bend her knee... signed up for our Chiropractic Help blog? You'll find it, called RSS at the bottom of the navigation bar at the left at the Chiropractic Help homepage. Then you'll get all the new pages as they come off the press! Mrs Y's neck pain wasn't responding as expected. A cycle of improvement, followed by relapse. True, she had a very arthritic neck, I foolishly reasoned, but that was not the cause of her problems. Finally, after one very serious attack of torticollis, I finally applied my mind. What is happening, Mrs Y? Sleeping on your tum again? Doing my neck exercises? Back on the laptop? Finally it came out. She was doing 100 crunches at the gym several times a week, and doing "lat pull downs", both absolute NO-NO's for patients with chronic neck pain. There are better ways to strengthen the core muscles. Had I questioned, thought, applied my mind earlier, I could have saved her several months of neck pain. And quite a lot of money! So, too if she had applied her mind, not presuming that this or that was okay. Nothing on health books this month, I confess, nothing new on diet. I've just finished Michener's epic Caribbean. All 800 pages, it comes highly recommended from me. 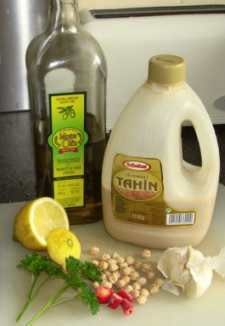 I have a kilogramme of garbanzo beans on the boil right now as I write for our authentic hummus recipe ... the queen of health foods, made in a jiffy once you've boiled the beans, aka chickpeas. I make it twice a week, you should too.